Well-known figures from various sectors were present at the opening of the Namushasha Heritage Centre, which showcases the culture of the Eastern Zambezi Region. Sweet-smelling thatch-roofed structures and attractive informative panels encircle an ancient baobab. Beyond the reed-fringed centre, an expanse of verdant riverine vegetation merges with the Kwando River and its waterworld. The clear sound of a swamp boubou intermingles with the rich sounds of the silimba and the swishing of reed skirts as the dancing girls wiggle hips and clap hands to the beat at the Namushasha Heritage Centre. It’s easy to miss the opportunity to experience the Caprivian cultures and feel the Zambezi spirit when driving from Rundu to Katima Mulilo. However, the recently-tarred road from Kongola makes it easy to pause for a taste of culture along the way. The Namushasha Heritage Centre was built recently, sponsored by the Millennium Challenge Account (MCA) and the Gondwana Collection Namibia. It is managed by the Mashi Conservancy, with all benefits returning to the conservancy. 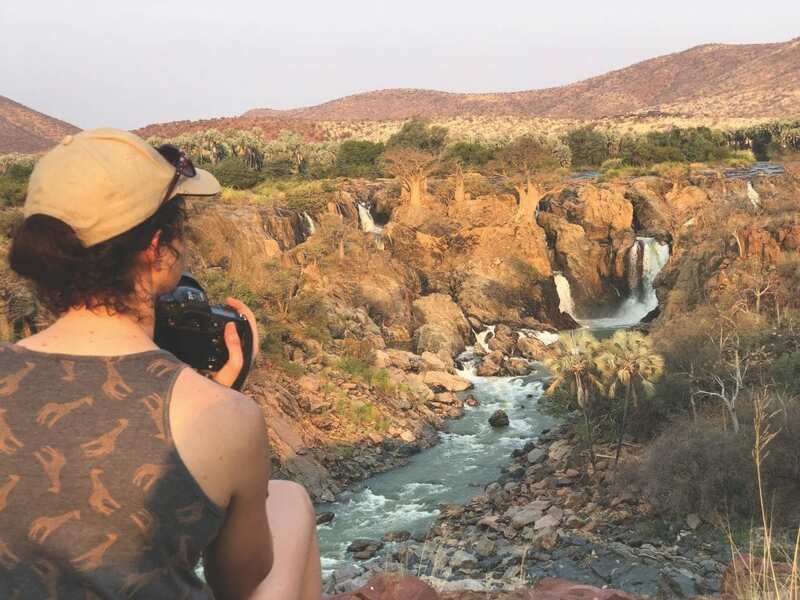 The Mashi Conservancy is one of the 31 conservancies in Namibia that have been supported by MCA-Namibia in its five-year project, which comes to a close in September this year. The conservancy is in the midst of an animal haven. It is separated from the Bwabwata National Park by the Kwando River and lies to the north of Mudumu National Park. Although the abundant game in the area is a draw card for tourists, the local people continually clash with wildlife damaging their crops, and have little opportunity to benefit from tourism. The Namushasha community attempted to start a traditional village in 2006, but with limited resources and no strong links to tourist initiatives, was unable to succeed. When the Gondwana Collection took over the Namushasha River Lodge in 2012, Gondwana immediately established good relations with the community and the Mashi Conservancy. With the assistance of the Millennium Challenge Corporation/MCA-N and Gondwana, it became possible to re-establish the centre. Antje Otto at the Namushasha Heritage Centre information board she helped to compile. 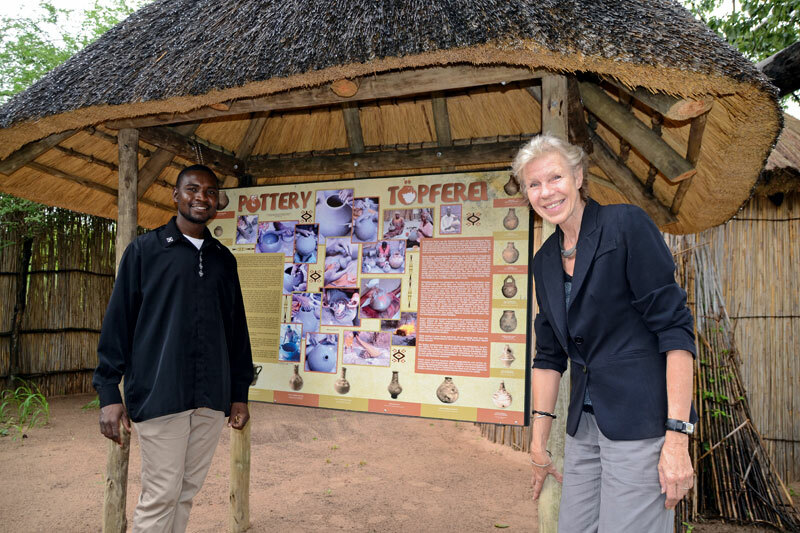 The attractive site under the baobab was selected, buildings were constructed and Gondwana contracted Antje Otto to assemble the information for the numerous boards that are displayed at the centre. Antje summarised her decades of comprehensive research for the information boards, which cover subject matter as diverse as musical instruments, agriculture, basketry, traditional healers and tribal authorities. The grand opening took place in February between summer rainshowers. The community welcomed honoured guests and representatives from the Ministry of Environment and Tourism (MET), World Wildlife Fund (WWF), Integrated Rural Development and Nature Conservation (IRDNC), MCA-N, Gondwana Collection, and the traditional authorities. 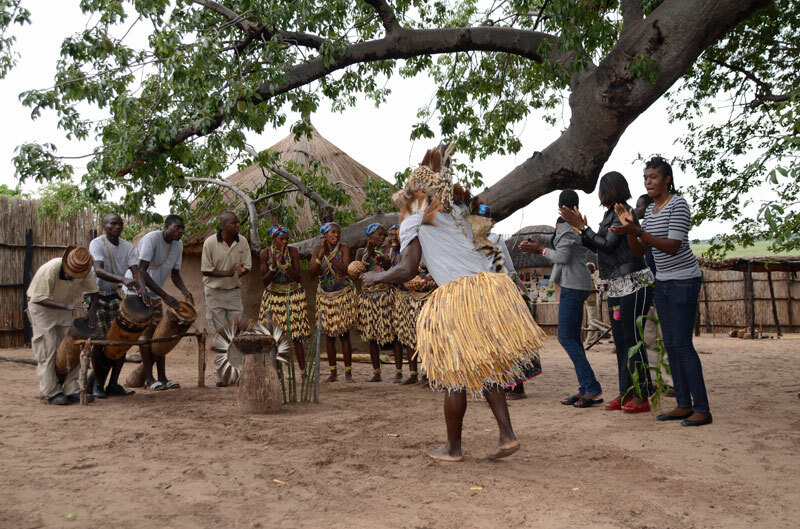 Guests had a chance to watch a lively performance and to walk around the centre where women demonstrate basket weaving and men use traditional methods to fashion metal, carve dugout canoes or play a challenging African board game in the sand. Namushasha community members at the centre on opening day. Among the speakers were the governor of the Zambezi Region, the Honourable Laurence Sampofu, WWF MD Chris Weaver, MCA-Namibia CEO Penny Akwenye, the director of regional services and park management at the Ministery of Environment and Tourism (MET) Colgar Sikopo, and the managing director of the Gondwana Collection, Mannfred Goldbeck. Dancers and musicians danced their way to the hall to open the gathering in true Zambezi style. After the ceremony, water lilies, a fresh rain-washed world, clay pots and drums were disregarded for a while when the gathering moved off to Namushasha River Lodge for a finger feast fit for Zambezi kings. The Heritage Centre showcases the fascinating culture of the Eastern Zambezi Region where, like many cultures nationwide, the old traditions are being lost to time as the younger generation embraces the 21st century and Western ways. Demonstrations of traditional song and dance, skills and crafts are complemented with comprehensive information on the history and traditions of Caprivian groups displayed on colourful information panels. The centre serves to reinforce cultural dignity as well as provide an income to members of the community and an annual levy to the conservancy. A private-sector and conservancy collaboration, the Namushasha Heritage Centre is a synergy between the Mashi community and the Gondwana Collection. 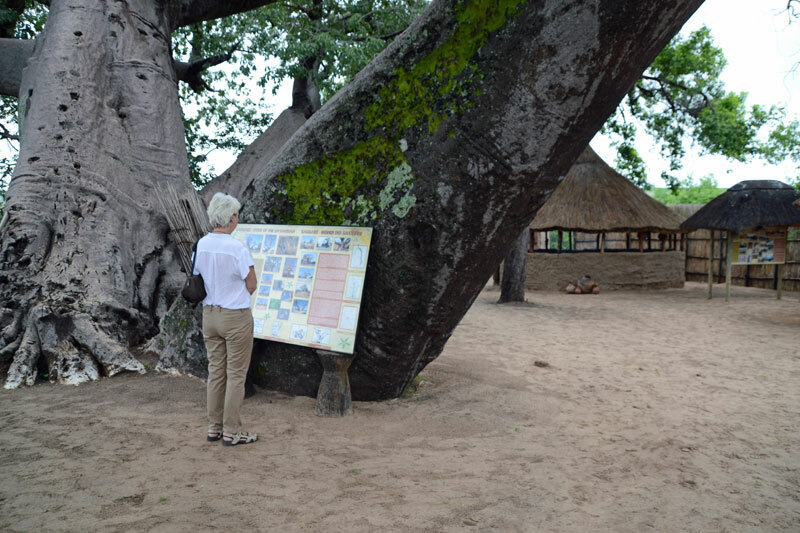 A visitor reading the board underneath the massive old Baobab tree. The lofty boughs of the giant baobab were once climbed to spot poachers attempting to cross the Kwando River. Poaching has fortunately diminished due to the establishment of the Bwabwata National Park where wildlife and humans coexist in multi-use areas and the successful conservancy programme, which allows members to manage their wildlife and resources, and appreciate the value of wildlife for sustainable utilisation and as a tourist attraction. Swords have been transformed into ploughshares and the tree is now witness to happier gatherings. 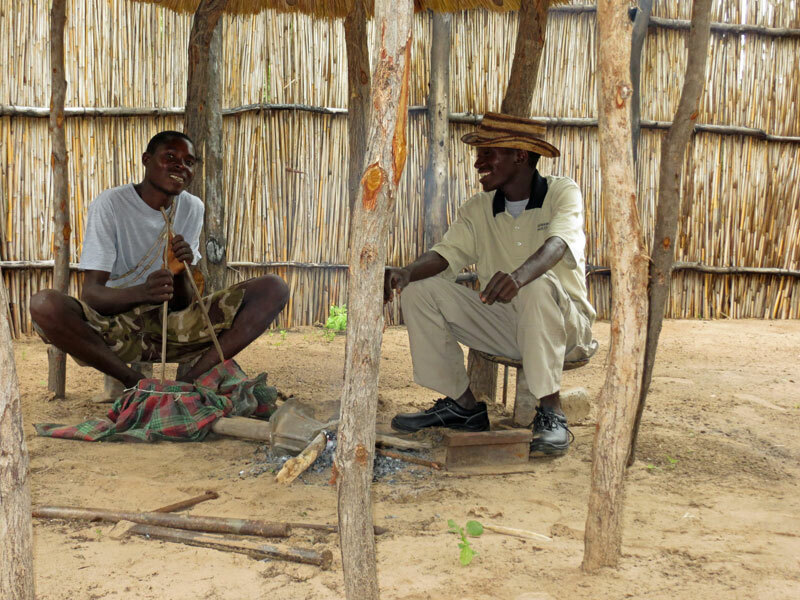 Even though the influence of the western world has reached north-eastern Namibia, the role of a traditional healer has remained paramount. The inganga or iñanga is a highly-respected person in the community who has a wealth of knowledge. Most often, he is called to this position by the spirits. As he regularly treats people with plant medicines, a vast knowledge of the plant world and its uses is acquired. The spiritual calling and acquisition of knowledge often begins in childhood. Sorcerers also still exist in Eastern Zambezian culture, employed by certain individuals to bring disease and misfortune to others. The culprit cannot, however, escape the eyes and methods of the inganga, who uses various means to identify him. In the past, someone accused of witchcraft had to undergo boiling water, a poison cup and fire tests. Today, he will only be required to pay a fine. Usually, the inganga will not depend only on his healing skills but will also grow crops and catch fish to sustain himself and his family. People in the eastern section of the Zambezi Region rely on crop cultivation and fishing for their sustenance. Millet, maize, beans, groundnuts, sorghum, melons and sweet cane are routinely planted. Crops are cultivated at different times in the various areas, although seeds are generally sowed after the first rains in October. The majority of fields are still prepared using draught animals. Sleighs were introduced in the 19th century by travellers and missionaries, and over time the local population began to harness oxen as draught animals. Surplus from the harvest is bartered and surplus maize is sold to mills in Katima Mulilo or Windhoek. A common sight in the Zambezi Region is women pounding maize, sorghum or millet into carved mortars with long wooden pestles as they have done since time immemorial. The flour is used for porridge or to make traditional beer. 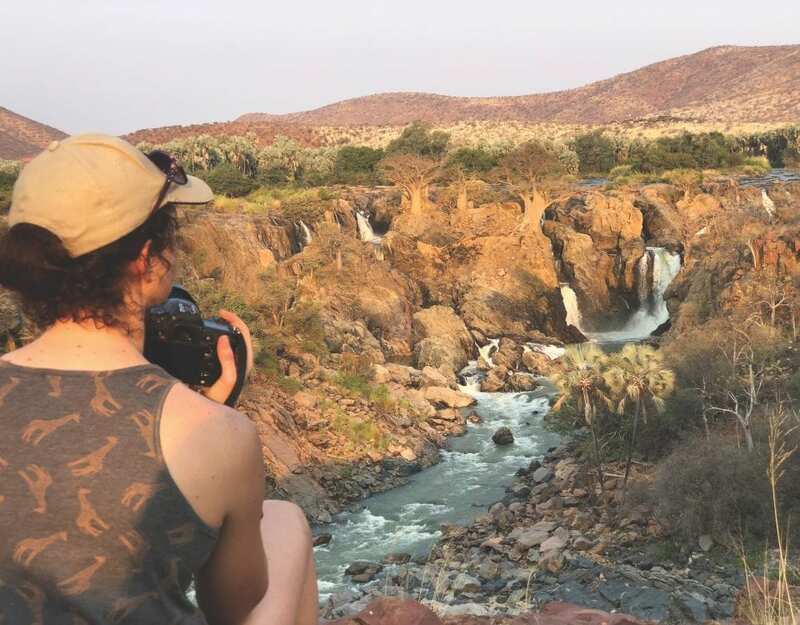 Unlike the Namibian population living in the arid and semi-arid areas of Namibia, those in the north-east enjoy abundant water, and fish are an important part of the diet. Popular fish species are tigerfish, catfish, tilapia and pike. A variety of fishing equipment is used, including gill nets, traps and weirs. Fishermen negotiate the waterways in dugout canoes. They are expert at paddling or punting in the river, their choice of propulsion depending on the depth of the water. 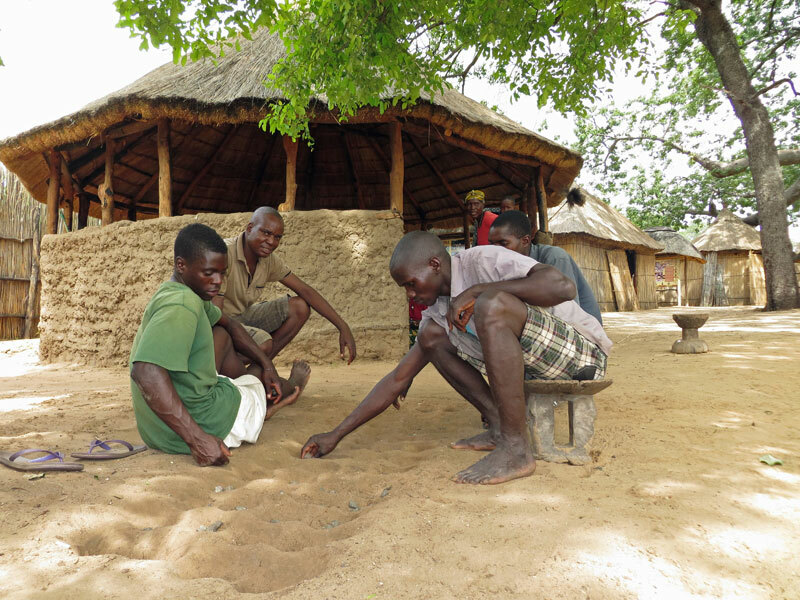 The Bantu-speaking groups and the Khwe of Eastern Caprivi have been known over the centuries for their skill in basketwork. The BaYeyi and the HaMbukushu in particular are praised as the most skilled basket makers in Southern Africa. 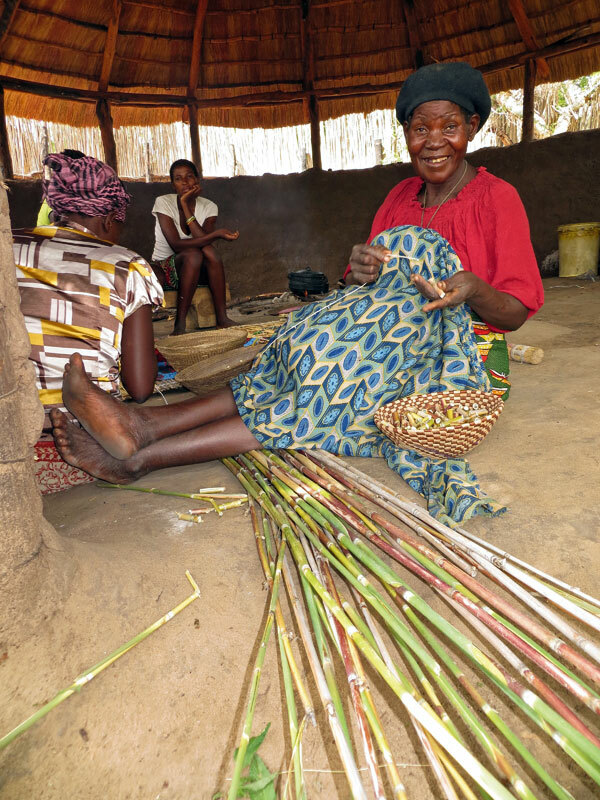 Baskets are woven by the women from the leaf fibre of the fan palm, as well as from grasses and reeds. Most baskets are made using the coil technique with the core consisting of grasses and the weft of palm-leaf fibre. The rounded baskets are used for storage and the flatter trays for winnowing. Also made are sleeping or sitting mats using grass or reeds. Although the basket-making tradition is dying out due to the increased use of plastic containers, tourist initiatives are helping to keep the skill alive and provide an outlet for women to sell their wares, enabling them to purchase food and other necessities for their families. The baskets are time-consuming works of art, reflecting aeons of basket-making skills and traditions that have been passed down from mother to daughter through the ages. When driving from Rundu to Katima Mulilo or vice versa, turn south at the Kongola intersection (the C49) and travel for 20 km. Take the Namushasha River Lodge turn-off, which will lead you to the Heritage Centre – an easy and accessible place to pause for a taste of Zambezian culture in an attractive river setting. A small shop also sells crafts and baskets. If staying at Namushasha, a short walking trail runs along the river from Namushasha River Lodge to the Heritage Centre where information boards enlighten guests about the fauna and flora of the wetland system in the Zambezi Region. Originally published in the Travel News Namibia Autumn 2014 edition.